is to attract the ultimate loyalty of 14 per cent of the vote, not 50 per cent. 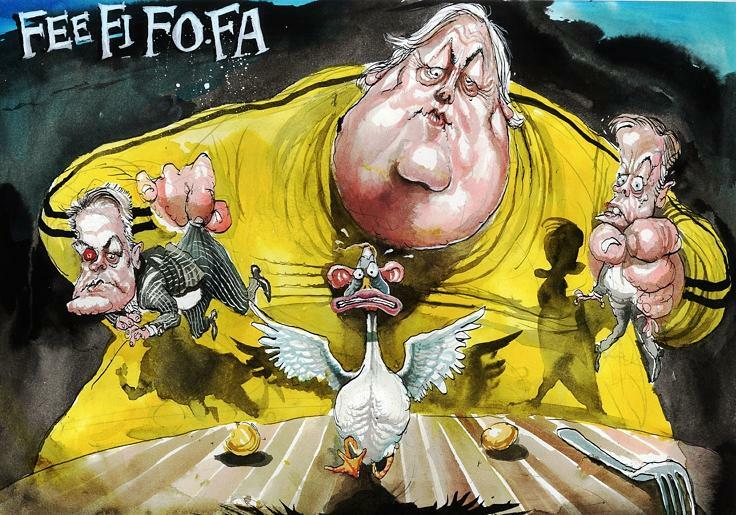 Every unsuccessful measure or rejection of some Coalition attempt to pander to one of its lobbies, such as the big banks, reinforces the government's unpopularity and increases Palmer's popularity and scrapbook. I think that Waterford goes too far. Sure, Palmer is creating maximum drama but so far he ends up supporting the Coalition after extracting minimal cobbled-together concessions during chaotic backroom meetings from which all stakeholders are excluded. A good example is Palmer's wheeling and dealing over the Coalition's attempts to roll back Labor's financial advice reforms so as to favour the interest of finance capital at the expense of consumers. Palmer sided with the Coalition and the minor amendments make little difference to ensure consumer protection. In doing so PUP didn't wait to consider the interim report into the financial system in the context of financial scandals, corruption and fraud by the finance industry that caused so much damage to the welfare of millions of Australian households; as well as a Senate inquiry that was highly critical of the financial planning operations of the Commonwealth Bank. PUP, in other words, rolled over, rather than standing their public ground. They didn't even consider separating banking from distribution or financial planning advice in terms of ownership and control given that 80% of the financial advice industry is now linked with banks; and that the financial advisors are just pushing bank products for a fee. These financial advisers have a substantial conflict of interest – the interests of their employer are at odds with the interests of their clients. PUP has sided withe Coalition in ensuring that financial advisers work for the interest of their employer --the Big Banks-- not for their clients. The government’s financial advice changes allow incentives for financial planners to push inappropriate investments products on consumers. So the Abbott government has succeeded in allowing sellers of financial products, such as financial planners, to receive incentive payments from fund managers so long as they are not a described as “commissions”. The reforms have overturn laws passed by the previous Labor government that imposed a blanket ban on incentive payments to planners when they give general advice to clients. It looks as if the Murray inquiry members were concerned about the adequacy of existing consumer protection measures. The Murray committee’s interim report asserts that disclosure rules in the financial advice industry have failed consumers and that current legislation may need to be overhauled to recognise sales practices that pervade the industry. In favouring the banks by winding back consumer protection in financial advice the the Abbott government’s bizarre desire is dumping the interests of the demographic which has been and will in the future be most adversely affected by bad financial advice---- Coalition voters. The Abbott government calls winding back of Labor’s FoFA reforms “reducing red tape”. The reality is that the winding back supports the banks at the expense of consumers. The Murray Inquiry says that "The Inquiry considers the principle of consumers being able to access advice that helps them meet their financial needs is undermined by the existence of conflicted remuneration structures in financial advice. " In spite of Palmer’s huffing and puffing about protecting the little people from the finance industry he banks and AMP, who control more than 70 per cent of financial planning, have got what they wanted. Advisers will have to tick a set of check boxes that they have gone through certain things with their clients. Bank tellers will be able to flog their employer’s superannuation funds to unsuspecting customers under the guise of it being only “general” advice. Palmer has traded Palmer United Party support for practically nothing in return. Most of the “changes” to the government’s diluting of Labor's Future of Financial Advice (FOFA) laws are simply re-statements of what the government intended anyway. FOFA reforms were put in place by the previous Labor government in response to a number of wealth management firm failures. One of the main issues in the mix was poor advice given by financial advisers to Australians, many of whom had their life savings placed into high risk investments, where returns did not meet expectations, and worse, in some cases, people were outright deceived. There have also been reports of poor or fraudulent advice to investors, where advisers recommended their own solutions, even if they were not the best for the investor concerned.